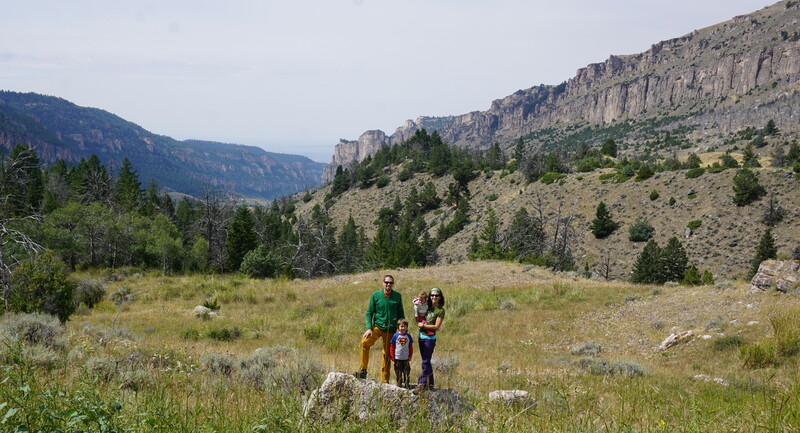 If you’re new around here, I’m recapping our family’s recent exploits in Wyoming, a few days at a time. If you missed Part 1 (the Lander edition), click here to catch up! For the deets on our first few days in Ten Sleep, read on! After an easy Saturday drive from Lander to Ten Sleep, we awoke on Sunday morning psyched and ready to crank out the long hike to the Sector Shinto wall in the French Cattle Ranch area. 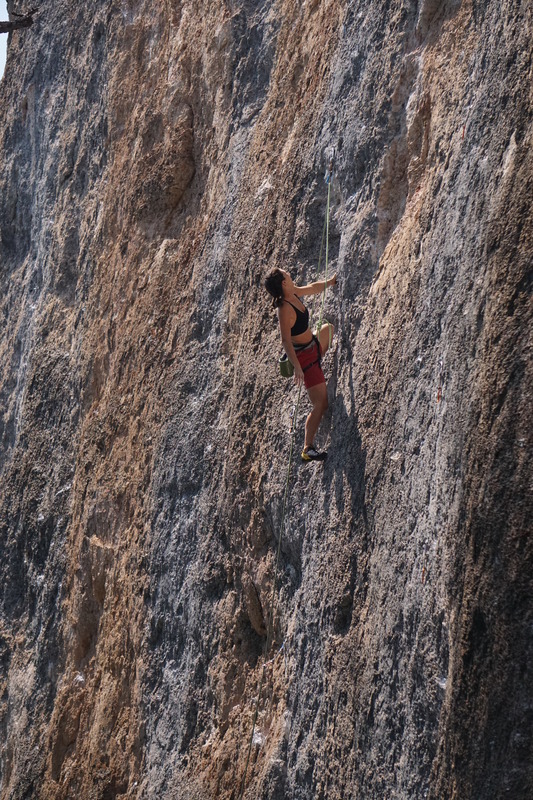 After a quick warm-up on an uncomfortably sharp 10a (Great Green Gobs…), we turned our sights to the main objective for the day, and possibly even the whole trip, Center El Shinto 12b/c. This 5 star classic is one of the most popular 12’s in the canyon, and for good reason. 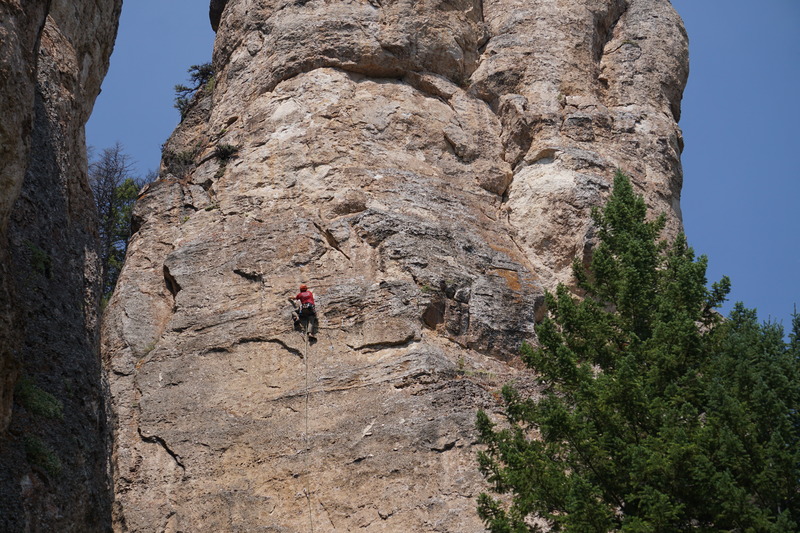 This route is technical face climbing at its finest – very sustained movement on stellar rock, and recently upgraded to a b/c “slashie” in the latest guide. 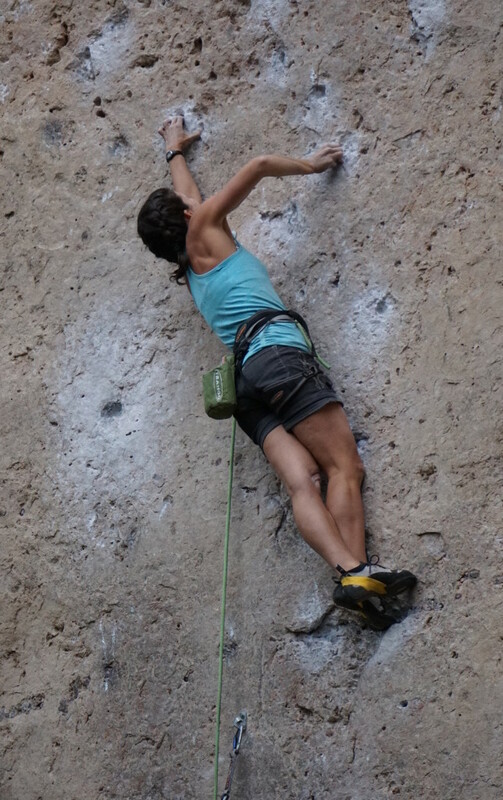 The crux is about 2/3 up, and includes a really difficult clip from a core intensive stance. 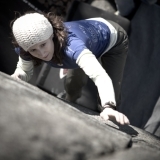 Having dogged my way up it on our last visit 3 years ago, I was hoping it would go down pretty quickly, considering I’m a lot stronger now than I was then…but after taking a crux beating while hanging draws, my confidence was more than a bit shaken. But knowing that the 2nd go is ALWAYS easier (draws are in, moves are familiar), I got on it again, hoping to at least make it through the hard clip this time before popping off. 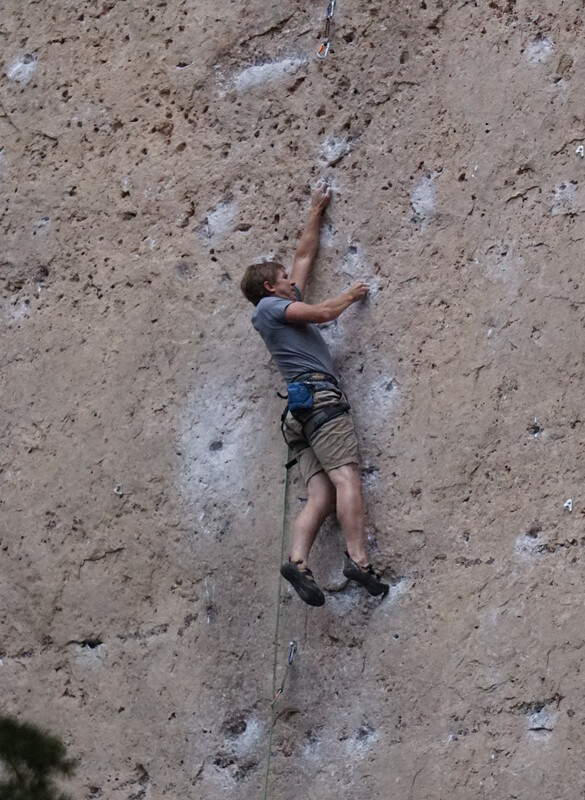 I made it up to the crux a lot more efficiently than before, and assumed the tenuous clipping position. I did NOT feel secure, and for a half-second contemplated grabbing the draw (how I’d made the clip before.) But my belayer shouted, “CLIP IT!”, so I did. The next few moves were thin, but I got through them to a decent stance. The upper bit wasn’t nearly as hard the 2nd time around, and before I knew it, I found myself clipping the chains. Woo-hoo! We still had time left in our day, so I decided I may as well take a run up Left El Shinto 12b, another must do on the wall. and another one who’s grade was changed in the latest guidebook (this time downgraded from 12c.) 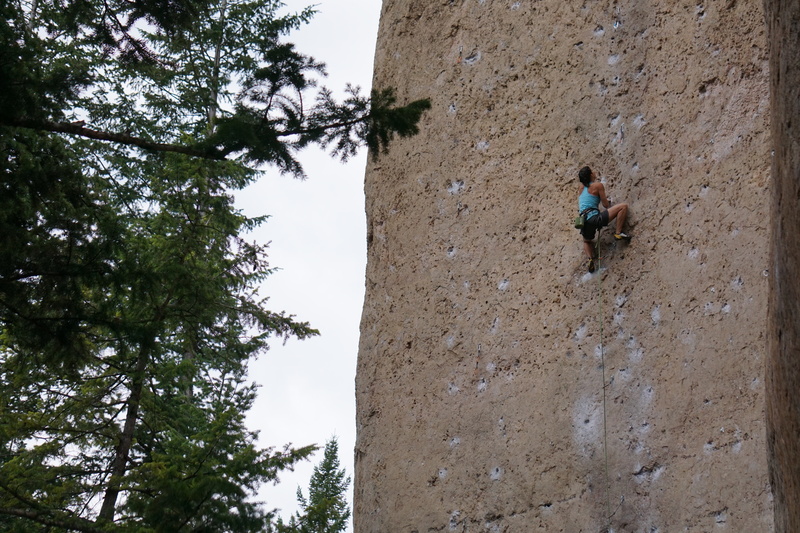 The initial boulder problem off the ground was really thin and balancy, and actually felt harder than the crux on Center, but the rest of the climbing was less sustained and with better rests. It was a fight to stay on in places, but I made it through to nab my hardest onsight yet (further confirmation that it wasn’t really 12c ;)). 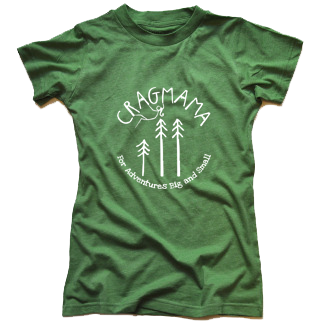 CragDaddy on his way to onsighting Tricks for You 12a. 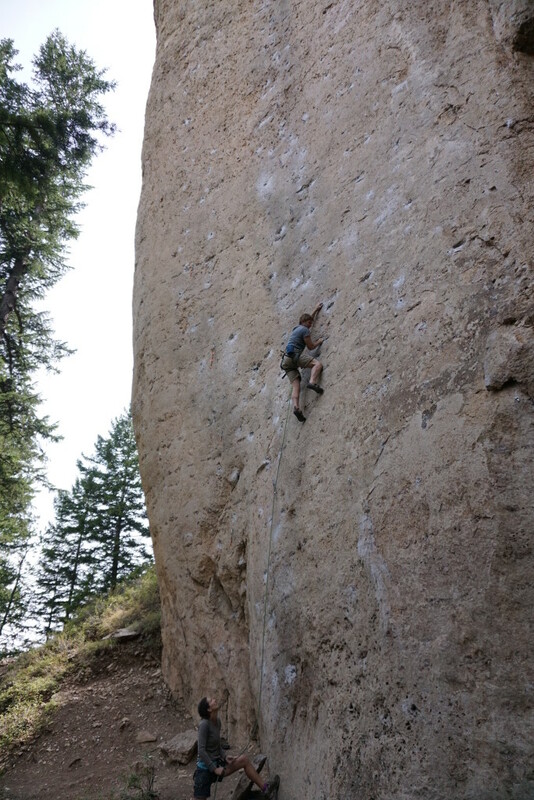 Meanwhile, our “third man” Caleb had been around the corner hanging draws on another 5-star classic – The Great White Behemoth 12b (or “12b+” as it reads in the new guide, whatever that means!) And while Behemoth was in many ways just as technical as Tricks for You, it was also much more powerful and bouldery – big moves off small pockets and tiny footholds. I went bolt to bolt to start with, and while I didn’t struggle too much with any individual move, the thought of putting the whole thing together seemed beastly intimidating, as there was a lot of sequencing that needed to be executed just right. But since I’d put in the work, I knew I owed myself a 2nd go. Girl beta…I promise my elbow is not out of joint, its just a weird photo angle! 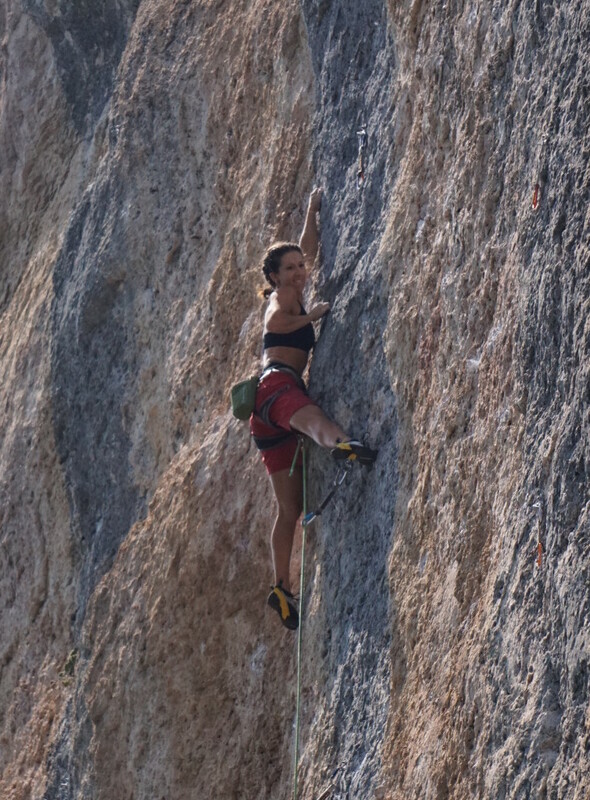 I was redlining the entire way, and just when I felt like my hands were going to involuntarily open up, I’d hit a hold that was just good enough to buy me a few more moves to the next decent hold, and so on…until I finally came screaming (literally) into the anchors. I was in grave danger of punting off with a handful of rope when I remembered there was a good stemming stance to clip from…PHEW! And thus went the Great White Behemoth…which, at 2nd go, was probably not the route I’ve worked the hardest for overall, but it’s a definite contender for the hardest fight in a single go. I was incredibly excited that it went down, and also super psyched to still be on pace for my “35th on my 35th goal! The requisite “Christmas card photo with stunning background” shot. While that may have ended our climbing adventures for the day, the hike out was anything but uneventful. Remember the creek crossing shenanigans I mentioned on the way in? 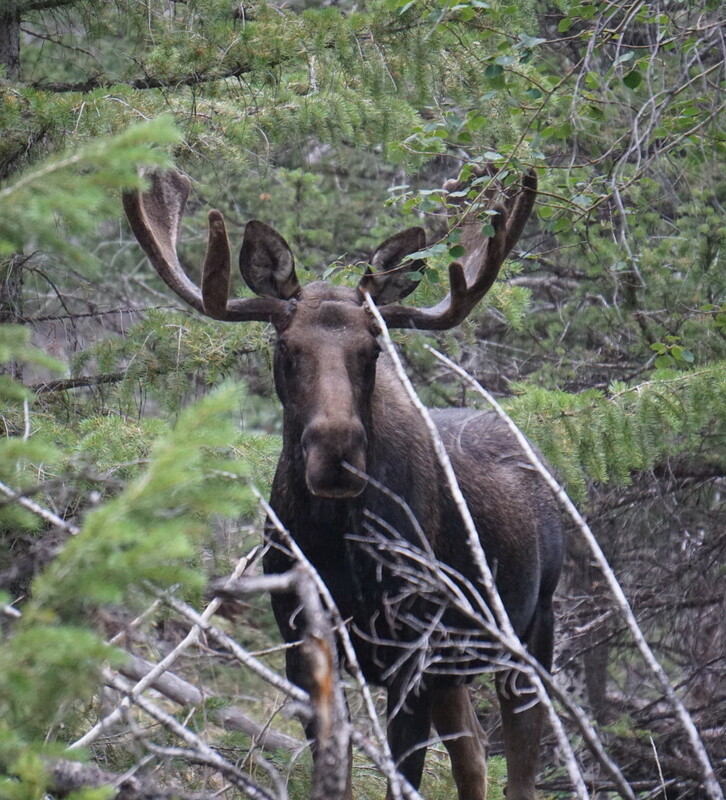 We had to find a different way across this time, because as we came down the hill and around the corner, we came face to face with a large bull moose about 30 feet down the trail! It was definitely a little unnerving, as thick brush on one side, a creek on the other, and a big hill to our backs didn’t leave a lot of room to get out of his way should he get feisty! Thankfully he seemed more curious than concerned about us, and after posing rather stoically for the camera, went back to his grazing while we bushwhacked around trying to find another way to get across the creek. 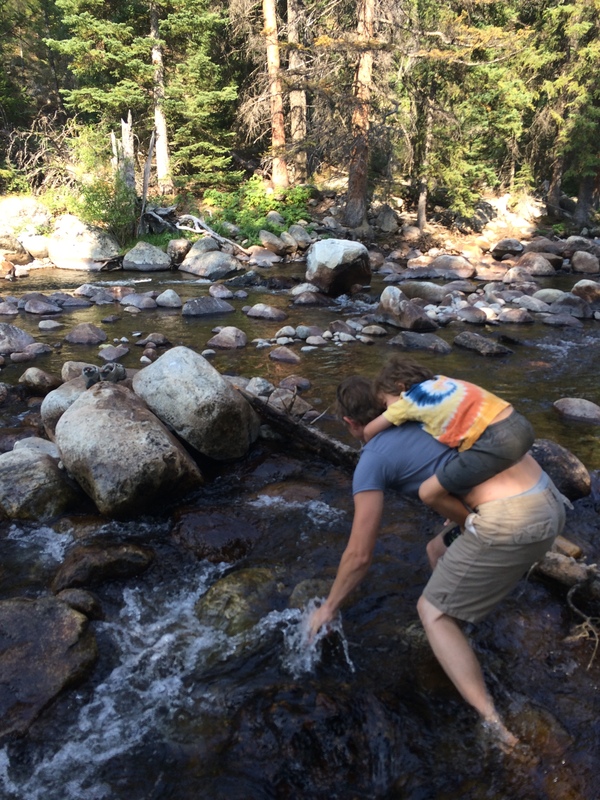 In the process, we discovered that our handsome friend had a lady friend as well, which added even more drama to a sketchy log crossing over shallow (but frigid and rushing) water! At the end of the trip, we all sat around and talked about which days were our favorites of the whole trip. 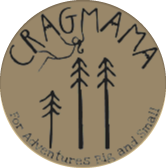 For me, it was a close call between the two days I just described – amazing climbing that shattered PR’s for both Crag-Daddy and I, and a spectacular nature encounter! Pretty hard to beat, although there were others in our crew who voted for what was yet to come, so don’t forget to come back next week to check out the recaps from the rest of our time at Ten Sleep, as well as our brief exploits in Logan Canyon!